Sri Lanka’s No. 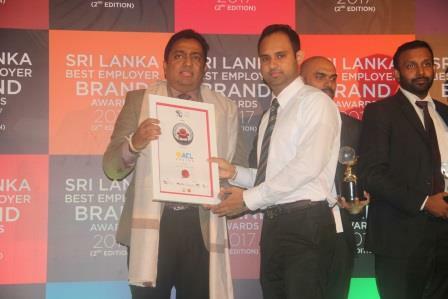 1 cable manufacturer in Sri Lanka, ACL Cables PLC achieved the prestigious Master Brand status for 2017, conferred by Chief Marketing Officers (CMO) Asia in partnership with the World Marketing Congress. During a glittering ceremony held recently, at Taj Samudra Hotel Colombo, presided by Education Minister Akila Viraj Kariyawasam as Chief Guest, ACL Cables was recognized for its superior brand value including its ascendency as the country’s premier cable provider. A Master Brand status is conferred only to top tier brands in a particular category and in recognition of market dominance. Once the status is awarded on a single brand, the competing brands are excluded from the category. While selecting the Master Brand CMO Asia carries out a detailed research evaluating all competing brands in the category considering criteria such as a brand’s leadership, brand growth, brand evolution, longevity, goodwill, customer loyalty and overall market acceptance. Commenting on the new status, Suren Madanayake, Managing Director, ACL Cables PLC elatedly noted, “We are pleased to win the above award proving ACL Cables as the No. 1 cable brand in the market. This esteemed status would not be possible without our steadfast customers including consumers, dealers, distributors and project customers. “ACL has continuously maintained a strong brand health creating positive brand experiences for all our customers. Quality has also become the bedrock of our brand and during new product development. Our new products such as the fire retardant and fire resistant cables, which has been tested and approved in accordance with national and international standards are examples of how we strive to maintain long term brand value,” he noted. “A Master Brand is a brand that has made it big. Master Brand in reality is a passion - a brand which has scaled the highest peak in the passion-scale of brands and their respective consumers. It is a passion of passions. Therefore, let’s respect the Master Brand for what it is. It is an exclusive club. Not too many members in this league. The esteemed and distinguished panel is confident that ACL Cables is a successful case in point to deserve the iconic status of a Master Brand,” he added. ACL Cables holds a market share of 70% with an annual revenue of 14.6 Billion as a group whilst marketing a diversified range of products including, electrical wiring (for households and construction projects), and accessories. ACL Cables is the pioneer in the local cable industry manufacturing a wide range of cables locally and internationally. The company has surpassed other competitors producing many first to market cables. These include fire rated cables such as fireguard, fire zero and fire survivor, which ACL solely holds the expertise and knowledge in manufacturing, together with proven excellence, employing the highest standards and recipient of required test certifications.